Since its inception in 2008 MEF has grown in its ability to provide town-wide grants through the generous support of individuals, businesses and organizations. Community support is essential in helping to raise the funds necessary to provide the grants. With increased contributions, we will be able to fund more grants. We extend an invitation to you to join us in working to achieve this goal. Your contributions will enable MEF to continue its important work in promoting excellence in education for learners of all ages. Contributions are welcome at any time and are tax-deductible as allowed by law. Contributions will be accepted by personal or business checks or through Paypal. In addition to contributions, opportunities to attend/or sponsor planned events are scheduled throughout the year. Make a tax-deductible donation now through Paypal, or mail your donation. Use the convenient link below. This is a letter appeal campaign held annually in February. Email Us to be put on the mailing list. Celebrate and honor someone exceptional in your life or your child's life. Say thank you to a teacher, administrator, daycare provider or other friend of education. Donations to the Please Take A Seat Campaign are "restricted" and can only be used in the Montville School District. Create a lasting memory honoring families, students, and businesses. Engraved brass plaques will be installed on the arm of a chair in the Montville High School Auditorium. 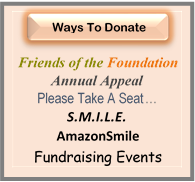 When you shop at AmazonSmile, Amazon donates 0.5% of the purchase price to Montville Education Foundation Inc. That may seem like a small amount, but nothing is ever too small. Learn more by clicking on the link below. Sign up, then bookmark AmazonSmile for future purchases. This annual tournament is held the 2nd Monday of August and has sold out each year. Get your foursomes registered and choose your sponsorship levels. For all information about this great event, click here. Check back often to find upcoming events. Copyright © 2009 | A 501(c)(3) Nonprofit Corporation Email Us!